The Hunger Games franchise comes to a conclusion this weekend with Lionsgate's release of The Hunger Games: Mockingjay - Part 2. While BoxOffice expects the film to dominate the box office this weekend, we don't expect the film to reach the same opening weekend heights that the previous installments of The Hunger Games franchise have reached. Meanwhile, Sony looks to claim second and third place this weekend with The Night Before and Spectre. Not much is expected from STX Entertainment's Secret in Their Eyes, while Open Road's Spotlight will look to build upon its platform performance as it expands into moderate release. - Opening weekend performances for the previous three installments of the franchise have ranged from $121.9 million (last year's Mockingjay - Part 1) to $158.1 million (2013's Catching Fire). - Final chapters of The Twilight Saga and The Hobbit performed very similarly to their predecessors, while the Harry Potter franchise experienced a surge in its audience with Harry Potter and the Deathly Hallows Part 2. - With a current 71 percent Tomatometer on Rotten Tomatoes, the film is going over slightly better with critics than Mockingjay - Part 1 did (which registered a 65 percent Tomatometer). - In the weeks leading up to its release, the film has been significantly softer on both Twitter and Flixster than Mockingjay - Part 1 was. - A sizable percentage of the audience for The Hunger Games and Catching Fire didn't show up for Mockingjay - Part 1. The franchise isn't as popular as it was only a few years ago and it's possible the franchise's audience size could still erode even further as a result. - The growing anticipation for Star Wars: The Force Awakens may cut into potential for Mockingjay - Part 2 among more casual fans of The Hunger Games franchise. - Seth Rogen has a proven track record at the box office when it comes to R-rated comedies, as Pineapple Express, This Is The End and Neighbors all having been strong performers. - The film has registered an encouraging level of online activity on Twitter, though it should also be noted that a sizable percentage of that activity has been negative in tone. - Early critical reviews for the film are trending more positive than negative. The film currently has a 69 percent Tomatometer on Rotten Tomatoes. 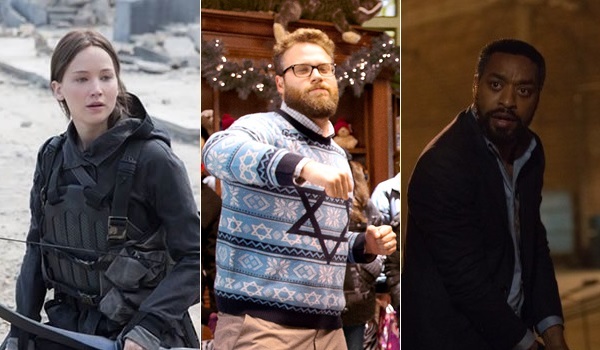 - Joseph Gordon-Levitt remains an unproven box office draw and Rogen has had his share of box office disappointments from time to time as well. - Anticipation for the film has been relativity soft on Flixster, especially for a film featuring either Rogen or Gordon-Levitt, as both actors have strong online followings. - Judging from its trailers and commercials, the film may not be as mainstream friendly as many of Rogen's previous efforts. - The film's cast, which includes Chiwetel Ejiofor, Nicole Kidman and Julia Roberts, should help the film appeal towards adult audiences. - STX Entertainment had success earlier this year with The Gift, which opened with $11.85 million and displayed healthy holding power. - Kidman and Roberts aren't the same box office draws they were earlier in their careers. - The film has been softer on both Twitter and Flixster than The Gift was before its release. - The film's subject matter may prove to be too bleak for audiences, especially during the holiday season. - With a current Tomatometer of 97 percent on Rotten Tomatoes, the film boasts some of the strongest critical reviews of any 2015 release. - The film has performed well in platform release thus far, as it took in $1.35 million this past weekend from 61 locations (for a per-location average of $22,191). - While it will be receiving a sizable expansion this weekend, the film will still be playing in a relatively modest 598 locations. - Birdman had trouble maintaining momentum during its initial expansions last year. While BoxOffice expects stronger initial expansions for Spotlight; it may have some trouble maintaining momentum as well (by standards for an awards season hopeful). BoxOffice projects this weekend's top ten films will total $194.0 million. That would represent a 5.1 percent increase over the $184.5 million top ten total from the same frame last year, which was led by the $121.9 million debut of The Hunger Games: Mockingjay - Part 1. The film has been softer on both Twitter and Flixster than The Gift was before its release.! The success of some film rules the entire box office. The most acceptable film by the viewer creates some great impact on the box office https://fundygo.com/equipment-financing/ . Not every movie can rule the box office it is possible by the movie which takes place a wonderful level in the viewer's mind.